Former Vice President Joe Biden speaks at the University of Pennsylvania’s Irvine Auditorium in Philadelphia on Tuesday, Feb. 19, 2019. Former Vice President Joe Biden wants to be president and is closer every day to being ready for a bid. But he's considering what would happen if the president or his allies make his family an issue in the campaign, NBC News reported. Aides close to Biden and other people he's recently spoken to say Biden's candidacy is a matter of when, not if — one aide called it a "slow boil" since the start of the year. 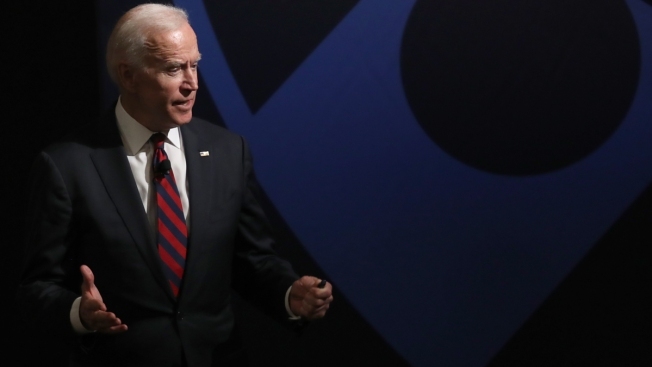 He is clear-eyed about the challenge of running and doesn't assume he would win the primary, even though he's confident he offers Democrats the best opponent to Trump, according to sources close to Biden. But Biden, who recently said that "everything revolves around family," must still have gut-check conversations with his children and grandchildren. His inner circle has discussed how Biden would need to react to a comment about the family, still reeling from the death of Beau Biden, from President Donald Trump.